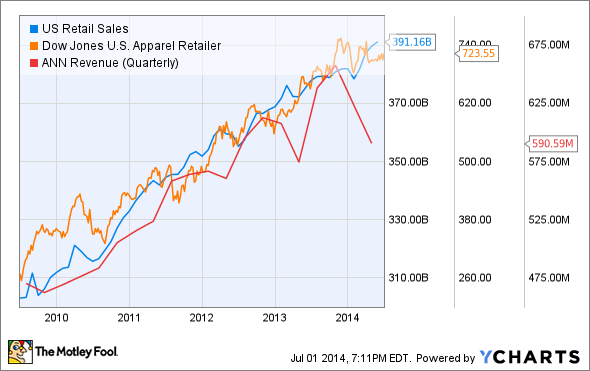 Retail sales are up, but that doesn't mean good news for all retailers. Chain store sales are popping . Week over week the change is only 1%, according to ICSC-Goldman, but year over year chain store sales are strong. Retail sales have increased 4.6%, their largest boost since December 2011. This is a good sign for the economy at large. Consumer spending is responsible for over two-thirds of the economy and this tends to translate into higher profits for retail companies and, in turn, higher stock prices. But not every company is likely to see gains. Take Ann (UNKNOWN:ANN.DL) for instance. The women's retail clothing company is known for its Ann Taylor, LOFT, and Loft Outlet stores, and has a market cap of $1.9 billion . When you compare its quarterly revenue to retail sales and the Dow Jones US Apparel Retailer Index, you can see that Ann Taylor's quarterly revenue tends to generally follow the same pattern. As you can see in the chart above, Ann Taylor's sales tends to follow the market-except for every fourth quarter. In turn, this cyclical downturn is having its effect on the company's pricing. Ann Taylor is trading at 22.38 times its earnings, whereas its industry's average is to trade at 18.34 times earnings, making the company more expensive than its peers. As a result, the market is getting nervous--analysts at UBS recently lowered their target estimate to $45 from $48 on the basis of tightening margins and, in April, Oppenheimer downgraded the stock to "perform" from "outperform" . The outlook isn't all bad for Ann. In May, the company reported positive earnings for the first fiscal quarter, and its earnings-per-share growth has been positive over the past two years . Ann also managed to boost net sales by almost 3%, including a one-time after-tax restructuring expense. Plus, Ann's LOFT brand is doing well . Net sales in the division increased by 4.3% compared to the original Ann Taylor brand and the company opened several new LOFT stores. But if the company doesn't harness this opportunity shareholders aren't going to see the benefits. The company also has the benefit of private equity firm Golden Gate Capital . In March, the company revealed it had purchased a 9.5% stake in Ann. Golden Gate, which has worked with Eddie Bauer and J Jill, among others, thinks it can turn the company around. In a letter to the CEO and COO of Ann , Golden Gate said its intends to "act as a constructive lead investor and work collaboratively with management and the Board to contribute to shareholder value creation" and that it "did not invest with the intention to put companies 'in play' or to change management or directors." But that may not be enough. Golden Gate sold off Eddie Bauer to Jos. A Bank for $825 million in February . It was a good deal for Golden Gate considering the private equity company had purchased Eddie Bauer for just $614 million in 2009, but that doesn't mean shareholders are going to see the same gains. Golden Gate turned J. JIll over in a similar fashion, buying the retailer for roughly $75 million in 2009 before selling its majority stake to Arcapita Bank in 2011. J. JIll retained its same management team as well . With Golden Gate's influence, Ann Taylor may be on the chopping block in a couple years. Ann Taylor could turn out to be a good long term bet but it is going to depend on the strength of the market, the retailer's ability to build on the LOFT brand and concept, and any potential power play from Golden Gate. The Foolish bet is to wait and see for a little while longer--there is a wide range of variables at play. Renee Ann Butler is a freelance finance writer and former management consultant with over 15 years of experience in business management and strategy. Her writing has appeared on Marketwatch, Insider Monkey, Seeking Alpha, and Motley Fool.